WORCESTER — “Is he going to be able to go home?” Susan Carlson asked. The future doctors tried to project confidence as they checked her husband, Tom, an ex-smoker who’d been rushed to the hospital gasping for breath. But in truth, they were nervous. Tom’s lung disease was nearing “end stage.” They had to tell the distraught couple about the grim options ahead, including a breathing machine, and ask a hard question: How much medical intervention did he want as he approached the end of his life? Greg Zandrow, 27, a student from Sharon who’s studying emergency medicine, faced the 75-year-old Carlson, who sat glumly on an exam table in his johnny. “We want to honor your wishes,” Zandrow ventured. It was just a training exercise, but for students who enter medical school to save lives, talking about end-of-life care can be scary and uncomfortable. That’s why the state’s four medical schools are embracing a growing national movement that views end-of-life training as just as integral to medical education as learning about childbirth. Until recently, unless they’ve specialized in palliative care, many medical students haven’t been taught about interacting with dying patients. 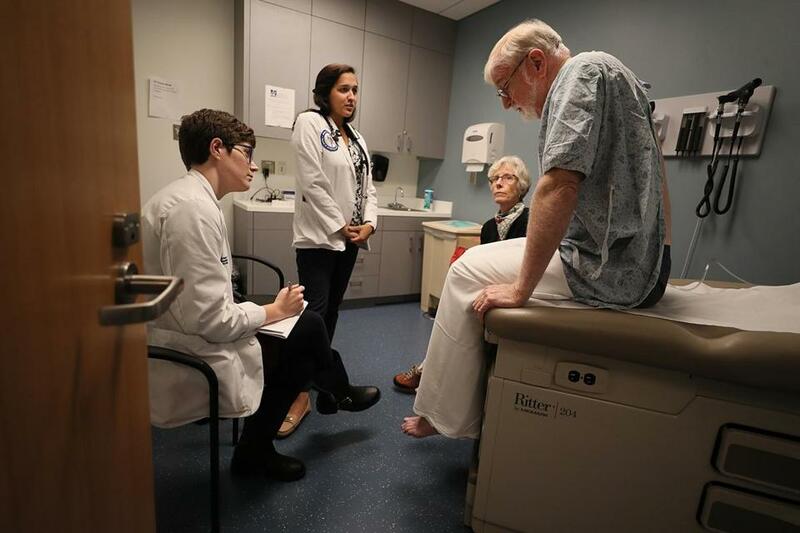 Role-playing games with actors — like those portraying the Carlsons in a simulation drill at the University of Massachusetts Medical School last week — teach students how to talk about end-of-life care with compassion, but also realism. The simulations, along with lectures, group discussions, and shadowing physicians talking to gravely ill patients, also help them find out what’s most important to dying patients and incorporate that into their care plans. For some of the students, the training was stressful. “I felt like I’d be dropping the hammer,” said Nathan Bombardier, 25, a medical student from Hadley. In the nation’s first joint program of its kind, UMass and the state’s other medical schools — Harvard, Tufts, and Boston University — are working to develop standards for end-of-life medical training and share their practices. The year-old effort is backed by the Massachusetts Coalition for Serious Illness Care, a nonprofit cofounded by Boston surgeon and writer Atul Gawande, whose latest book, “Being Mortal,” urges a rethinking of aging and death. “We’d like every medical student, nursing student, social worker, and people in the religious world to stop and think about their own feelings, and that will help them have these conversations about serious illnesses with patients,” said Maureen Bisognano, who cochairs the coalition and is a senior fellow at the Institute for Healthcare Improvement in Boston. UMass Medical School students Stephanie Bond and Neiha Kidwai conferred with actors (Jackson Royal and Lisa Piehler) portraying a dying man and his wife. 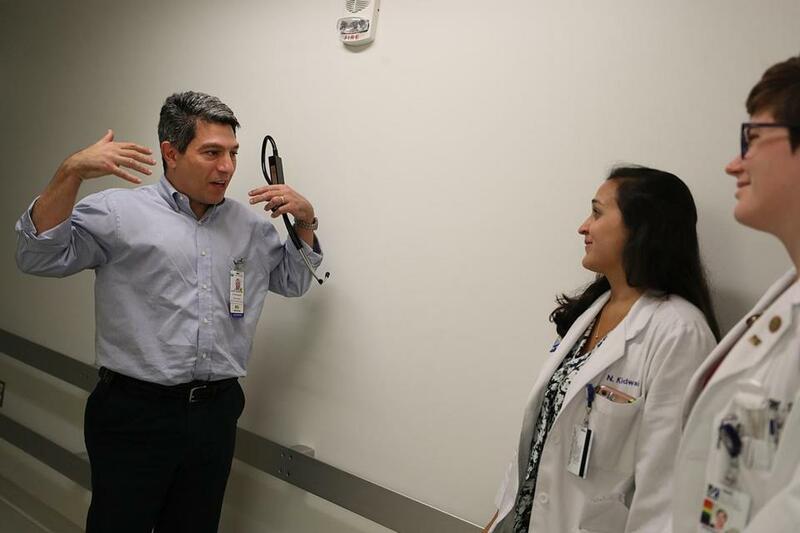 The fourth-year medical students who took part in last week’s training program at UMass’s Albert Sherman Center weren’t told beforehand what the simulation would focus on. Afterward, as they collectively exhaled, their debriefing session with their instructors was telling. “Medical training is so much about diagnosis and treatment,” said Neiha Kidwai, 27, a student from Madison, Conn., who is studying internal medicine. “Having these conversations wasn’t exactly what I thought about” when imagining a career as a doctor. “I think there’s an art to finding that balance, to be sympathetic but also to be truthful,” said Chris Chenelle, 28, a student from Dunstable who’s studying anesthesiology. Bombardier, who wants to practice dermatology, said the reality of working with patients close to death “was a shock to me.” Before the training, he said, “I had never had to answer the toughest questions from patients and talk about the risks and benefits” of end-stage care. That’s exactly what the simulation exercise demanded of the doctors in training. As Dr. Jennifer Reidy, chief of palliative care at UMass, told the students, patients like Tom Carlson — who in the training exercise was suffering from exacerbation of a lung condition called chronic obstructive pulmonary disease — decline over time. And while they may recover from periodic episodes of wheezing and struggling for breath, they don’t always return to their baseline health. By scanning Carlson’s medical history, studying his latest test results, and consulting an organ failure trajectory chart, the students concluded that this episode was more serious than a routine flare-up. The white-coated UMass students entered the mock emergency room in pairs in a series of scenarios with escalating tension. Two of them ran through their diagnosis with Carlson, a tall man with a white beard who listened in seeming bewilderment as his wife gripped his hand. “I’m just trying to catch my breath,” Carlson told them. The patient described taking oxygen and steroid medicine at home and past trips to the hospital. “We may need to do some more treatment than you can do at home,” said Stephanie Bond, 27, a student from Lexington who’s studying plastic surgery. Dr. Majid Yazdani instructed UMass Medical School students Neiha Kidwai and Stephanie Bond. The students could see Carlson wasn’t happy to hear this. He frowned as he absorbed the forbidding terms for ventilation — BiPAP and tracheal intubation — and their invasiveness seemed to gradually dawn on him. But they also faulted one of the students for sitting with his legs crossed, a pose that seemed to the actors too casual for the dire situation. They criticized another student for standing and talking to the Carlsons, who were both sitting. “It was like you were overpowering us,” Piehler said. The actors also talked about the importance of letting the patients feel like they were in control, even when they couldn’t be. One of the most difficult lessons learned: Individual patients may change their minds over time about how far they want doctors to go to keep them alive. Patients and their families don’t always agree on the value of risky, last-ditch medical procedures. So doctors sometimes have to act almost as marriage or family counselors as the family ponders its next steps. They also have to decide when to raise the possibility of hospice care, which focuses on comfort and lack of pain in the last phase of a terminal disease.